In the past 10 to IS years there has been dramatic improvement in the survival of children with acute lymphoblastic leukemia. At the present time, over 50% of children with this disease will be alive and free of their disease at least 5 years from the time of their initial diagnosis. Although a number of factors have contributed to this improvement, perhaps none has been as important as the institution of central nervous system preventive therapy (eNS prophylaxis). 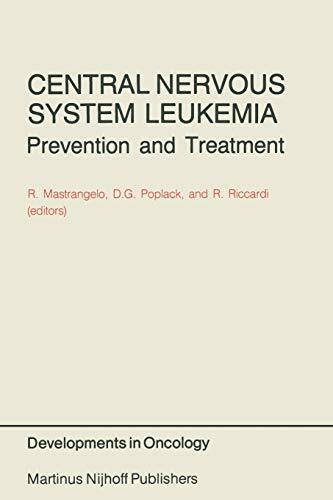 However, despite the efficacy of eNS prophylaxis, the prevention and treatment of central nervous system leukemia continues to pose a formidable clinical challenge to the pediatric oncologist. Although successful in most cases, eNS preventive therapy remains ineffective for a small but significant subset of patients at high risk for developing eNS disease. Moreover, it has become increasingly evident that some methods of eNS preventive therapy are associated with long-term, adverse eNS sequelae. Thus, considerable controversy exists regarding the optimal method of eNS prophylaxis. Treatment of the patient who develops overt meningeal leukemia has not been as successful and continues to pose a major clinical challenge. Despite the ability of intrathecal chemotherapy and/or radiation therapy to induce eNS remission, most patients suffer subsequent relapse and ultimate survival is usually signifi- cantly compromised. It is evident that newer approaches to treatment for this patient group must be identified before major improvement for this patient group is likely to occur.